Spend your North Myrtle Beach, South Carolina vacation at Arcadian One, a fabulous oceanfront North Myrtle Beach high-rise that sits right on the beach next to the Atlantic Ocean and is close to all of the North Myrtle Beach attractions! Arcadian One offers two-, three- and four-bedroom condos that come equipped with the best of amenities for you and your guests. The outdoor amenities of Arcadian One are outstanding as well, and the waves of the Atlantic Ocean and miles of white sandy beach will be your playground! Located in a quiet neighborhood on Shore Drive in North Myrtle Beach, Arcadian One lets you relax and have the beach vacation you always wanted. We offer our guests a beautiful oceanfront pool surrounded by plenty of lounge chairs that will be the perfect place for you to relax and work on your tan. Our picnic area is a wonderful place for you and your guests to gather for a meal—why not bring your fishing pole with you to North Myrtle Beach and catch something for dinner? There is nothing better than fresh seafood enjoyed outdoors in the refreshing ocean breezes! 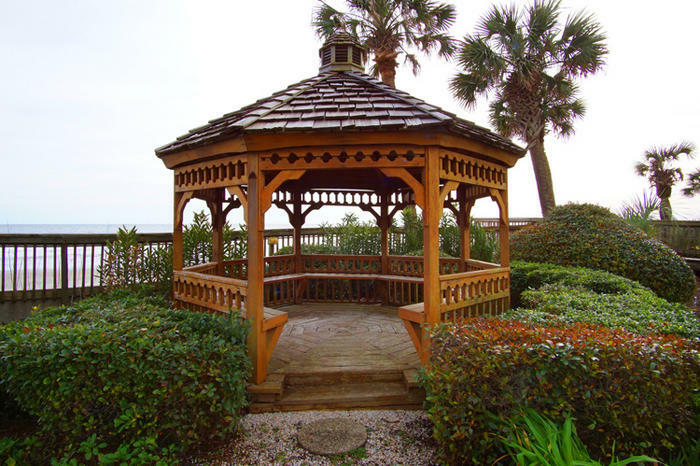 For those romantic moments, our quaint gazebo along the beach will provide you with the ideal spot to watch the South Carolina sunrise or get a few stolen kisses in! Arcadian One also features lighted tennis courts, so if you are too busy during the day exploring all of the nearby North Myrtle Beach attractions to get in a game, you can enjoy a game in the cooler temperatures after the sun goes down! Speaking of attractions, Arcadian One is just a short distance from Tanger Outlet, Barefoot Landing, and lots of fabulous North Myrtle Beach restaurants. Our convenient location is also close to the more than 100 gorgeous golf courses in the North Myrtle Beach area, so do not forget to bring your clubs! Stroll along the boardwalk and people watch, rent bikes and take a ride along the beach, zip down the slides at a water park or join a fishing or dolphin-spotting charter. Whether you are planning a North Myrtle Beach vacation with the family, your golfing buddies or a group of girlfriends, staying at an Arcadian One vacation rental is a great way to enjoy all of the water sports, shopping, hiking, putt-putt, nightlife and entertainment that this area of South Carolina is famous for! Elliott Beach Rentals is not affiliated with onsite management or the HOA of Arcadian One.